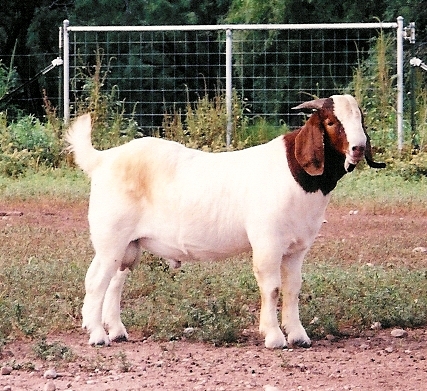 Elmo is a son of Sunny Acres Aaron who also sired the high gaining buck at Langston University in 2003 and 2004, and the winner of the 2003 Pasture Performance Test. Elmo's impressive pedigree includes Glipsie and Emmitt. 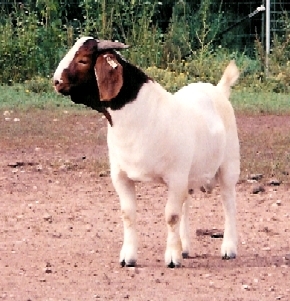 We used him for the first time in Fall 2004, and he was our top testing sire at the 2005 test. 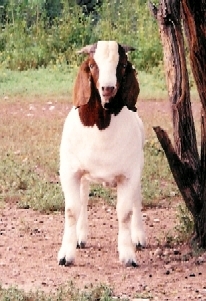 During the summer of 2005 he got in with the does and bred some early, then on September 29, 2005, 2 days before we planned on breeding him to more does, he got his head stuck in a feeder, panicked, and dragged it to the fence where he and the feeder got tangled in the hot wire. He died, and I wound up making a trip to Sonora, TX to lease his sire Aaron from Marvin. We have since purchased another Aaron son, Great Balls of Fire I, an impressive red paint buck.